Agile Coaching Canvas is a thinking tool to help co-create a sticky bold vision of agile change. 1. As an individual or self-coaching tool: the Canvas can help you (e.g. a consulting agile coach) build a sticky vision of the coaching journey for your clients (e.g. scrum teams). 2. As a peer coaching tool: it can be a great helper during your peer Agile coach / ScrumMaster dialogs to help each other get clearer pictures of your coaching strategies and tactics. 3. As a team coaching tool: during team ‘futurospectives’ the Canvas is to help teams co-create a shared vision of their future along with some insights on how to get there. Agile Coaching Canvas. Download it as a PDF below. Instruction Sheet gives guidances on using the Canvas. It will serve you as a pocket helper on your first coaching sessions based on Agile Coaching Canvas. Download it below along with other supporting materials. 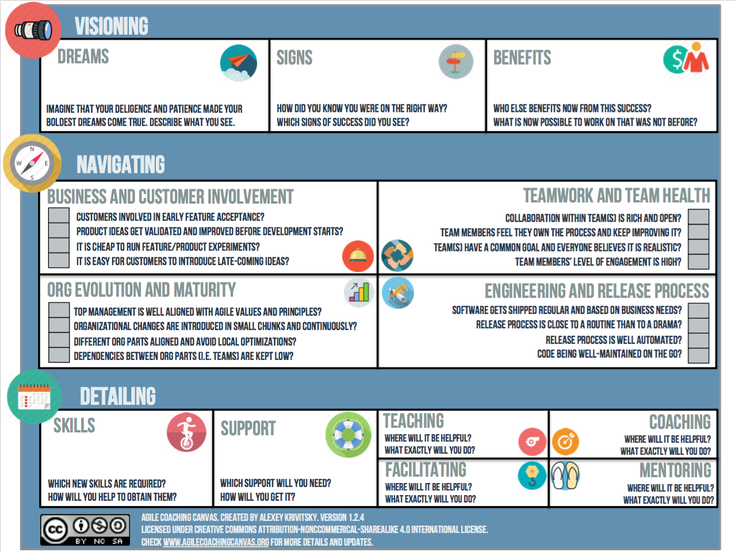 Agile Coaching Canvas is a freshly released tool. I am promoting it by writing articles, blogging, speaking at conferences. And I need your help. So have you tried the tool and loved it - write it up! And I'll gladly add your link to the list of materials below. We will notify you only in case of major updates to the materials. This work is licences under Creative Commons Attribution-NonCommercial-ShareAlike 4.0 International License.